Email. You use it constantly. And it’s the number-one application to keep your organization functioning, lines of communication flowing, and productivity seamless. Organizations need email to stay up-and running all the time. After all, it’s supposed to just work, right? This is where trouble often sets in. 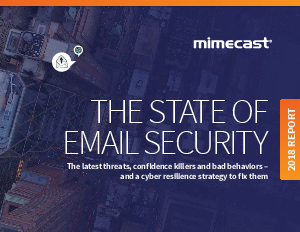 Cybercriminals use email constantly, too. It’s the number-one vector used to initiate attacks like malware delivery (think ransomware), impersonations and phishing attacks. In fact, almost 90% of organizations* have seen the volume of phishing attacks either rise or stay the same over the past 12 months. Internal threats have also been on the rise: Most organizations have encountered internal threats driven by careless employees (88%), compromised accounts (80%) or malicious insiders (70%) over the last year.